The tunnel with a diameter of 60cm satisfying the requirements of FCI. The tunnel is reinforced with hoops of spring wire. Made from durable PVC with a grammage of 620g/m2 with a guarantee of up to -20°C, UV stabilized. Smooth inner seam. Colapsed tunnel with a fixed round part of length 1m and diameter 60cm. 3m length cloth. Possible different color combinations. Stabilizing bag AMY provides reliable fixation for agility tunnels all diameters. Stabilization bag serves for fixation tunnel any diameter in one position. 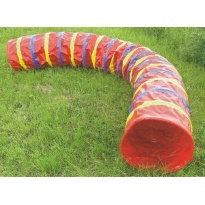 Stabilizing bag SARA provides reliable fixation for agility tunnels with a diameter of 60 cm.